Left to Right: Brandon Lambert, John Principe, Max Stephens, Davis Jenkins, Travis Hammond, Tony Fenner, Daniel Sedacca, and Matthew Welsh. 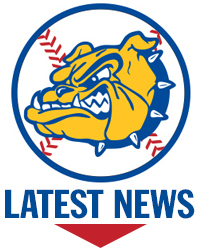 Welcome to the official website of the Chamblee Bulldogs Baseball Program. This site is managed and maintained by the Chamblee Baseball Booster Club. On this site, we will provide team schedules, news and season updates for the Chamblee Charter High School and Middle School baseball teams. We welcome your comments and support throughout the season. Any photographs and/or items of interest are always welcome. Stay tuned for information on how to send us these things. We hope that you find this site to be informative, interactive and enjoyable and if you haven’t already, we encourage you to join the Booster Club to support this program and help our boys have a successful season. President, Chamblee Baseball Booster Club, Inc.